Geeks rejoice! 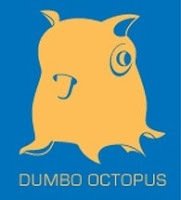 You've seen the intriquing photograph of the newly discoverd dumbo octopus, which I highlighted here last month. Now you can buy your very own Grimpoteuthis t-shirt, courtesy of McSweeney's. Grimpoteuthis was introduced to the world in the book, The Deep: The Extraordinary Creatures of the Abyss by Claire Nouvian, which features more examples of previously unknown, and even stranger, ocean life. Do People Take Satisfaction in Being Taxed?